Jam packed details in how to use vinegar for your life. Detailing the versatility of vinegar, this book will give you and your family the needed information to get through a hectic day with an added sense of confidence and cleanness. From Health and Beauty to Cleaning, you can learn how to save money while using vinegar daily! Using vinegar, not only will save you money in your daily home and health needs, but you will be using vinegar, which is an all-natural product! Vinegar is an all-natural solution to clean and deodorize throughout your home. Vinegar is great used on laundry, shoes, carpets, your elbows and feet, cars, floors, wood, linoleum and the list continues to grow. Do you hate those irritating and smelly chemicals you currently use to clean your house? A natural and environmentally safe solution is to use Vinegar. You will find everything you need to know about cleaning your home using Vinegar and a whole lot more. Discover the world of vinegar, used for centuries, famous for it's healing and cleaning properties. 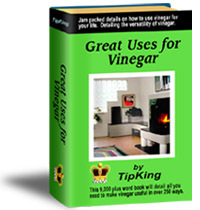 I have spent over 5 years researching the properties and usefulness of vinegar gathering tips for your personal use. This book is displayed free of charge for your information and enjoyment. In addition to the book you will find extra resources looking at apple cider vinegar, vinegar articles and hundreds of vinegar tips. Please use the links on the left of this page to browse through the content of this site.